phone is a stylish, cost effective telephony solution, ideal for a home office or shared/common areas, such as lobbies, hallways and break rooms or anywhere needing simple and reliable connectivity. The VVX 101 full duplex Type 1-compliant speakerphone with legendary Polycom® Acoustic Clarity™ and Polycom® Acoustic Fence™ technology that delivers excellent sound quality and enables noise- and echo-free conversations that are as natural as being there. 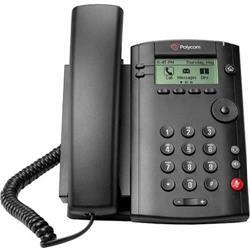 The Polycom VVX 101 comes with a familiar, intuitive user interface with multi-language support that you can use without having to think about the "how to". The VVX 101 phone is engineered to make installation, configuration, and upgrades as simple and efficient as possible. An enterprise-grade, Web- based configuration method allows administrators to easily provision and maintain a large number of phones throughout an organization. Additionally, the extensive administrative feature set included ensures that hosted service providers have the latest technologies to integrate the VVX 101 seamlessly into their existing telephony environment. The VVX 101 is designed for interoperability and is certified to interoperate with the industry's broadest range of PBX systems and SIP call control platforms.